Jeff Parker is in the house tonight with his review of a couple more nifty Hot Toys items - take it away, Jeff! Firstly, Happy New Year to you all. And a big thanks you to Michael for running another one of my reviews. Superman, like Bats and Spidey has a pretty voracious fan base, so any desirable items tend to sell pretty well. When Superman Returns (SR) was released last year Mattel completely dropped the ball on what could have been a great line, so collectors were forced to look from the main stream for what they craved. DC Direct made a reasonableish attempt at the figure in their 13” range, but if it was high-end quality you were after the two big hitters were Medicom and Hot Toys (HT). Both manufacturers interpretations have their fans, but I think it’s fair to say in most people’s eyes the HT version came out on top and Michael reviewed it here. I regretted not picking it up at the time and on the secondary market its price soon took off like… well, Superman, and regularly went for prices in excess of $200. HT then followed up with a great Clark/Supes reveal figure this also appreciated in value dramatically after release. Now the problem was if you wanted either figure you had to dig deep to afford them on the secondary market. 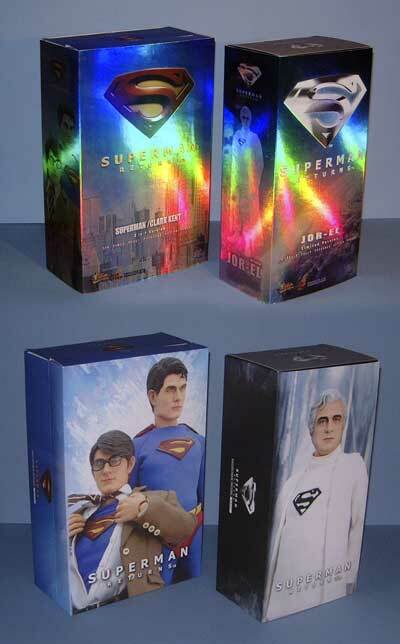 So to answer a lot of prayers HT have now released a Superman/Clark Kent, 2 in 1 figure, and as if that wasn’t enough they’ve even given us his dear old pop Jor-El as played by Marlon Brando, who was brought back from the dead in the new movie using CG effects. Both come with the Movie Masterpiece series (MMS) metallic foil slip on sleeve, and both are the same depth but that’s pretty much where any similarities end, well apart from the fact they are both obviously branded as ‘Superman Returns’. 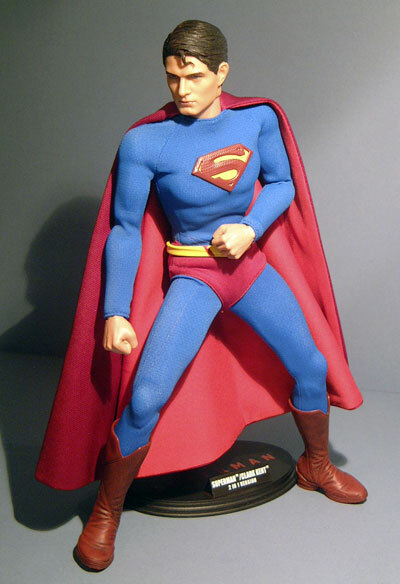 Jor-El's box has an over all blue/grey palette and carries a number of impressive photos of the figure. The front of the foil sleeve has a pic of Earth/Krypton viewed from space with a silver ‘S’ logo above it; the back has full body pics of the figure. On the back of the flap fronted box within are pictures of his accessories. They are shown as boots, hmm, OK I’ll let them have that one, then hands and head? Since when was a head an accessory and as you only get one set of hands they’re hardly an extra either. To be fair I wasn’t expecting any accessories and on the back of the foil slip cover they are described as ‘special features’, but it tickled me to see a head listed as an accessory. 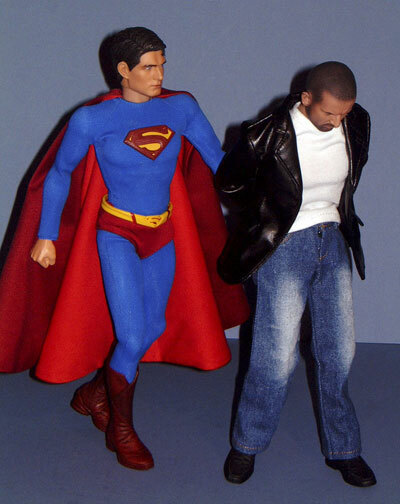 Inside Jor–El lies fully assembled and dressed in a black vac formed tray with five twisties holding him in place. Now Supes, though the box is the same depth, it is about 2” wider and once removed from its sleeve you’ll see it is a two tray velcroed box, like the SST Star Wars line but without the magnets. The left tray holds the Clark Kent shoes, sock tops, open-hands, suit, shirt and tie. 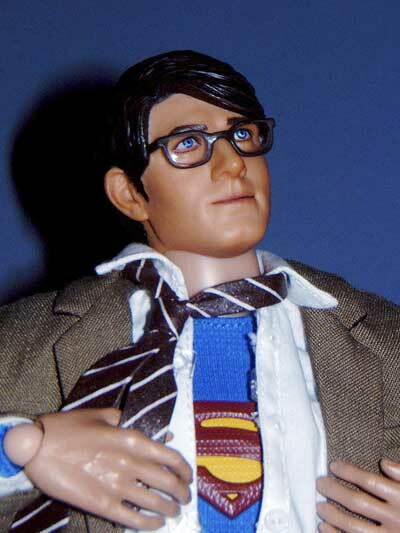 The right side holds the fully dressed and assembled Superman figure with fist hands attached along side his Clark Kent alternate head, he is like his father held in place with 5 twisties. The over all palette for Supes box is a royal blue and the back of the 2 tray box again shows hands, boots and heads as accessories, but as you get two sets of each it ‘kind ‘ of makes a little more sense. The metallic sleeve has a picture of the Daily Planet building against the Metropolis skyline and the back shows the Supes/Clark transformation. All in all two very nicely designed boxes, that all importantly protect the figures perfectly. 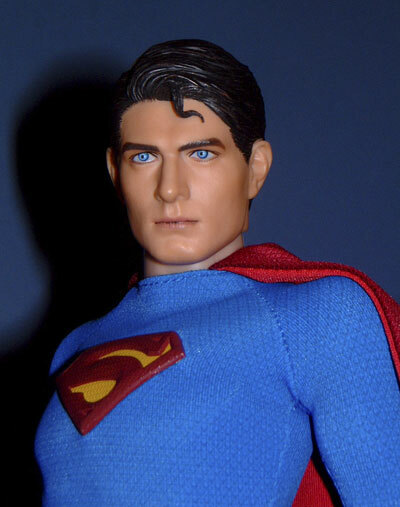 This still isn’t a bang on likeness for Brandon Routh As Superman but it is in my opinion very close, and it is vastly superior to the previous version both in sculpt and paint apps. 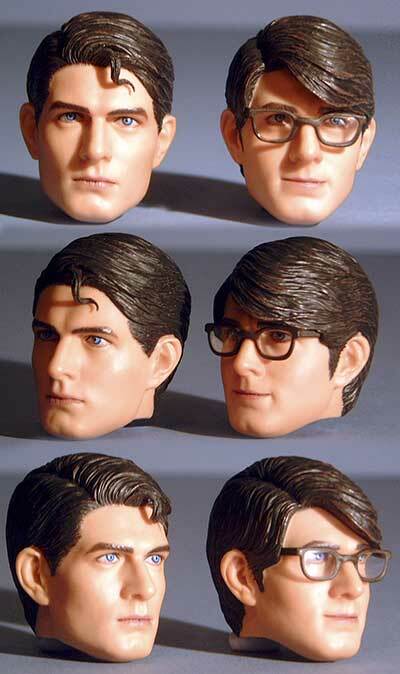 Although I prefer the Superman head to the Clark one there definitely seems to be more of Routh in the Clark version, Yulli (the sculptor) has given him that classic, slightly goofy bemused face that Christopher Reeve perfected so well in the original movies and Routh did a sterling job of mimicking in Returns. The hair on Clark is also expertly crafted, as when I first saw the proto pics I was sure because of the long flowing sweep of hair over the left eye it would be a separate stuck on hair sculpt. But it isn’t, apart from the glasses the whole head is one piece, and beautifully sculpted it is too. The glasses, though not removable are without a doubt the best 1/6 scale glasses I’ve seen to date. The ones included with the SST Giles from Buffy figure were pretty good, but these are outstanding. The Superman head, though not quite as Routh-like as Clarks is still a fantastic piece of work and has a far more steely and determined expression than version 1. Like Clark he has a fantastic hair sculpt and the beautifully sculpted kiss curl is the only part stuck on as a separate. 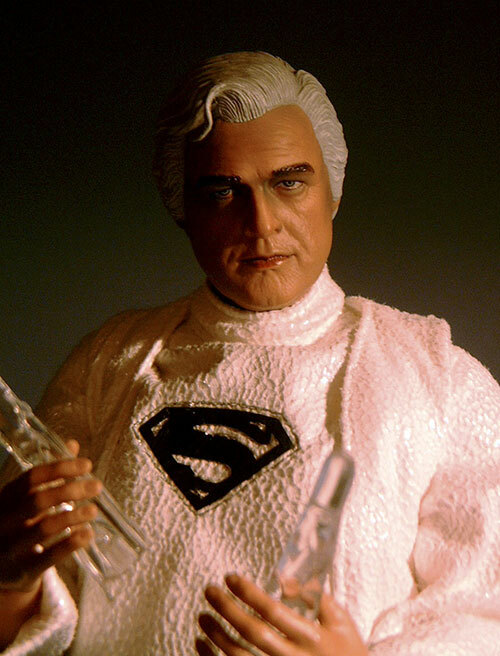 In many ways this deserves to be a four star figure but we have to keep Yulli on her toes and the four stars just had to go to …..
Jor-El, this is an outstanding and incredibly subtle piece of sculpting, and there is no way anyone could mistake it for anyone other than Brando, it just is Brando, from the kink in his nose to the sleepy eyes his likeness has been captured near perfectly. Like the other two heads there is also some great work on the hair and he sports a separate but seamlessly stuck on kiss curl much like Supes but hanging to the left instead. I received my figures just days before Christmas (thanks Santa) which means this will be overlooked in many 2007 ‘best of’ poles, but that is such a shame as it’s just about the nicest facial sculpt I’ve seen all year. 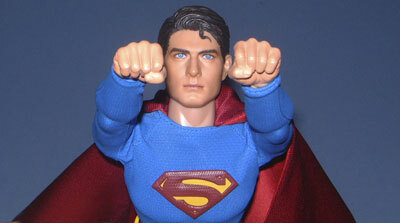 You also get two sets of hands with Supes, one relaxed and one in fists, both are convincing and well sculpted. Jor-El just comes with a relaxed pair the same as Clarks. Hot Toys seem to have a bit of a dream team at the moment in the form of Yulli on facial sculpts and J.C.Hong on proto paint apps and these two figures show that they’re still working in perfect harmony. Comparing again to the first HT Supes these paint apps are a quantum leap ahead with lovely skin tones. Supes and Clark share a similar palette, as you would expect with nice clean colours on the flesh and some very crisp work around the eyes. Supes eyes in particular are painted with consecutive blue rings and in certain lights or in some photo’s they seem to actually glow, a very convincing job, especially for a dude with X-ray vision. The hair on both has some nice tones in it as well, instead of being just a flat block; some washes have been applied that really bring the great sculpting out. Both have the mouths picked out as well but neither suffers from ‘lipstick’. Jor-El's paint job is exceptional, HT have given us some fantastic paint apps of late on things like the Predator 2 Elder, POTC and Prison Break and this figure just continues that great escalation in quality. He comes with some amazingly delicate work on his skin tones and the work on the eyes is again very subtle, If I had to have any criticism it would be that the hair could perhaps be a little lighter, as on set Brando's hair was practically white, but giving it this slightly greyer tone actually makes for a more convincing representation and shows off the sculpting to far better effect. Both these figures come with the true-type body, you can check out pics over at the HT web site to see all the joints. 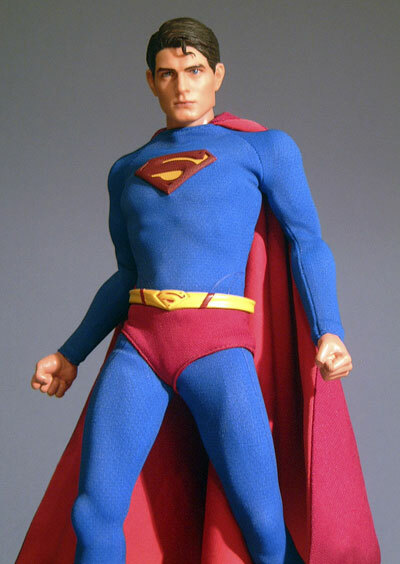 I’ve been over this body plenty of times before, but you’ll notice a change since the first Superman figure, they’ve improved the shoulder articulation, this means that when seen in a skin tight spandex suit like this one you’ll notice he’s quite a bit broader in the shoulders. 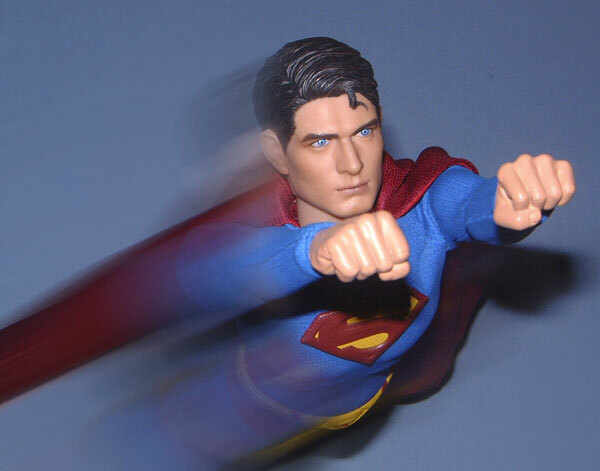 Not a problem for a Superhero like Supes, but that improved articulation means the line from neck to top of arm isn’t quite as natural, you can check out some great comp shots by Shaun over on the Sideshow freaks board here. I’d like to thank Shaun Wong for sharing these, you can check out more of his impressive collection on his website here. If you read Michael’s review for version 1 you’ll have seen he pondered that a full Clark outfit would have been nice as an accessory, but unrealistic, well not that unrealistic as this time Superman comes with a great range of accessories, in as much as he has a complete new Clark Kent head sculpt and complete outfit, all these will be covered in other categories. In fact if you have a spare true-type body you have all you need for two complete figures. He also comes with the HT MMS stand. Jor-El sadly comes with only a stand and rather surprisingly some spare bare feet as the boots he comes with have the little cups you push the ankle post into like Power Loader Ripley and others. But bare in mind this is how he’s portrayed in SR, not the original movies, so while a kryptonite crystal shard might have been nice it wouldn’t have been movie accurate. I’ve read on various Forums that people are holding out for Jor-El in his black outfit as well, but as far as I know HT only have the rights to SR so unless they get the rights to Superman 1 and 2 (please get it, please get it) we may never see Jor-El as this much wanted version. Well as I said Supes comes with two complete outfits. Clark’s, the bonus outfit if you will, consists of moulded shoes with small cups inside that the ankle joint attaches to directly, sock tops that fit over the lower leg to give the appearance of a full sock, white shirt, this is very nicely tailored and fastens with poppers, I was hoping we might get a Prison Break style shirt with working buttons but as this has to be able to come of and on easily it makes sense. He also has a working necktie with a proper sliding knot, this was a relief as I hate cheap looking elastic backed ties as they are always either too loose or so tight the spoil the line of the shirt collar. Lastly comes his amazingly tailored suit, I recently got hold of the Prison break Michael Scofield street clothes special version and both sport two of the finest 1/6 scale suits I’ve seen. They come well tailored and pressed with working pockets and buttons through out. Supes suit fits fantastically as I guess skin-tight spandex should, but this time round they’ve even mimicked the paternation and texture running all over the suit and S logo. The cut of his shorts is also far more screen accurate this time looking more like trunks rather than speedo's and the belt looks pretty spot on as well. The cape is attached around the collar with a line of Velcro. I found the best way to attach this was to fully remove the neck post and tuck the cape in all round the collar, then pop the post back in and it’s seamless. The boots are a sculpted soft plastic and look to have feet permanently stuck inside that the ankle posts attach to. Best representation of the super suit in 1/6 so far me thinks! You can see a lot of these details in the comp shots by Shaun above. 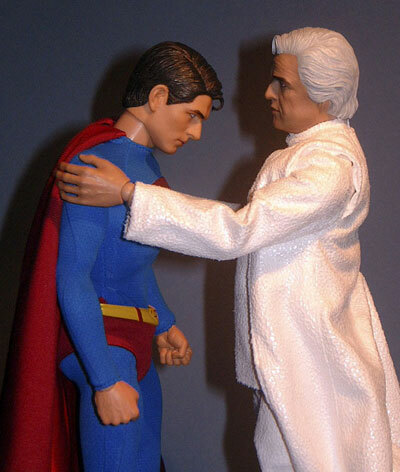 Jor-El's outfit is nowhere near as complex as either of the two you get with Supes but it is no-less screen accurate. He comes in white ankle boots, again with the internal cup (but you get a set of bare feet as described above). Then there’s a pair of white trousers, a turtle-neck tunic top with embroidered ‘S’ logo and lastly a long sleeveless waist-coat style garment, this has a wire running through it’s hem for posing. All the clothes are white and made in a soft textured material that does a good job of approximating the costume worn by Brando on screen and with the right photography they seem to glow just like in the movie. 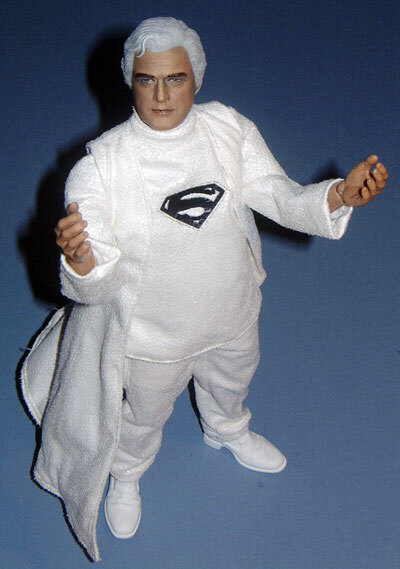 There is also a soft padded ‘belly’ on Jor-El that Velcro’s up the back to mimic Brando’s increasing girth at the time. 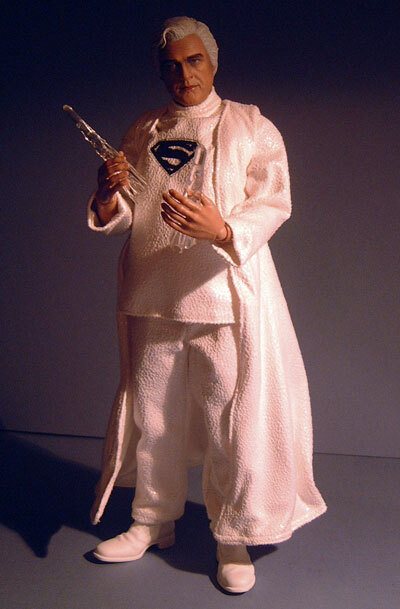 I see Jor-El as one purely for your collector purists, as it’s not a figure I can see many kids wanting to play with! Hell, who am I kidding, though not quite up at Medicom’s prices both of these are too expensive to be considered play-things by most mere mortals, but what I’m trying to say is the Superman/Clark figure would make a great toy as it’s well designed, well put together and robust enough to stand up to most ‘normal’ play, (unless of course you’re Sid from Toy Story). But from a collectors angle, and lets face it these are only gonna end up in the hands of collectors, as they’re selling quicker than hot Cocoa on Hoth, so unless you pre-ordered or snap one up quickly ‘NOW’ there’s not much chance they’ll be about that long. 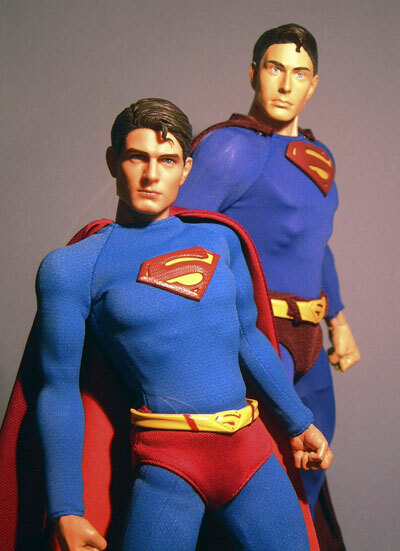 So we can all start praying that HT get the licence for the classic 70’s Superman I & II, as a Reeve Supes next to this Routh one would be too cool! On pre-order some places were doing Jor-El for $79.99, needless to say they all seem to have gone. I’m still seeing quite a few out on eBay for $99, but you’ll have to add international postage to that, so this coupled with his lack of accessories (I know I already said it’s screen accurate to Superman returns… well reasonably accurate as you only see a distorted image of his face) but, well, would it have hurt to give us a Kryptonite crystal? 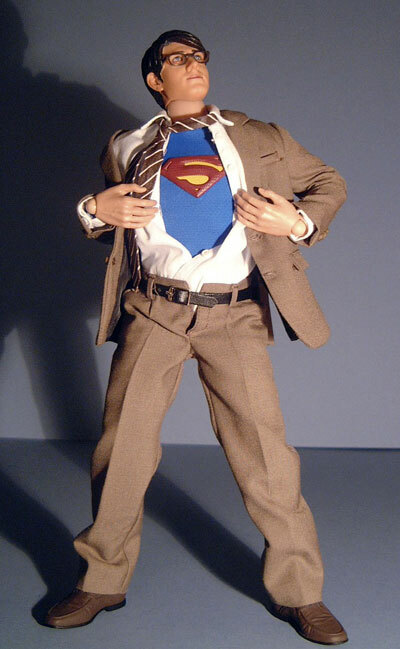 I think Supes on the other hand with his wealth of accessories is nothing short of a bargain as there are still some out there on eBay for $119 and I feel this figure may well go on to become a 1/6 collecting grail. Much like the Takara Batman begins and Medicom Rocketeer (note; both these figures got a re-release, so far we haven’t had any ‘straight’ re-releases from HT, just variations). 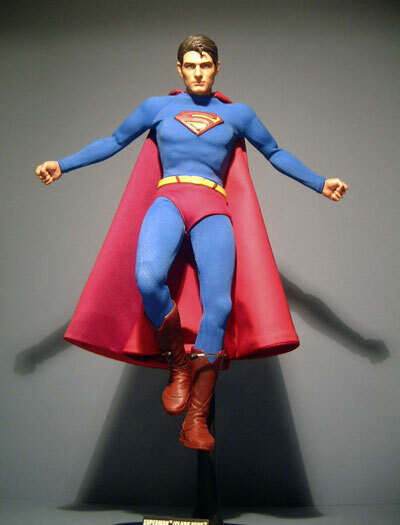 There’s no denying the first HT Superman figure was a top notch item, that I regretted passing on many times, but my patience paid off as now we have an even better version, but my gut instinct is it won’t be around for long, so if you’re debating don’t leave it too long. And Jor-El… well it’s freakin Brando as Jor-El, it’s always seemed to me that for a million and one reasons based around peoples estates, licensing restrictions and timing we’d never get any quality 1/6 figures from the original Superman films, but here one is, may it please be the first of many as to countless people Christopher Reeve will always be their Superman. Where you’ll find a number for sale at various prices from $99 to $129 for Jor-El and Supes is up for anything from £119 to $199. Good luck!